People line up well in advance of the 1:00 opening. Sunday feels finally like summer. The doors open and I expect to see the rapacious art dealers toss people over the edge in their greedy haste to hit the tables and seize the name works. 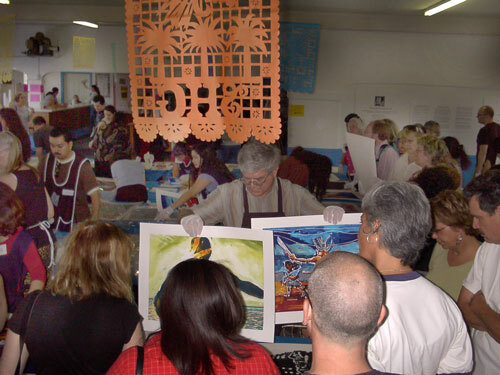 The obnoxious dealer tipos aren't much visible this year, allowing Raza and other art lovers fill in along the tables, the lucky ones getting the too-few cotton gloves, others either waiting to get gloves, or stand with folded arts as a volunteer leafs through the rich variety of prints. Thirty dollar tables. Fifty. A hundred fifty. Each spot offers selected work; serigraphs in numbered series, monoprints totally unique, etchings, lino cuts, a world of art at affordable prices. The sale features work from the current atelier, a silent auction, and stuff from a variety of workshops for people of varied skill and imagination. I buy a calavera monoprint that feels good. After enjoying the main showroom, people in the know migrate to the flat files room where an informed buyer--and the dealers--find early work of notable artists who got a start at SHG, as well as limited pieces of exceptional merit and value. I wish I had big enough for that piece. Large Wayne Healy images were snapped up, and the last Alma Lopez went just as this image was shot--I have this image of Lizette, on a ceramic mug Espresso Mi Cultura sold earlier in the year. 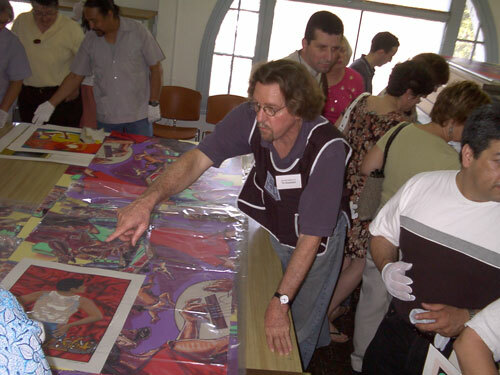 Alma Lopez' iris print of a flower-bikini'd woman posed after the model of la Virgen de Guadalupe raised a cause celebre a few years ago among the Manitos. Self Help Graphics' sale this year featured a serigraph edition dervied from the digital print. As in the New Mexico exhibit, this year's print brings out a vocal group of protestors. After reciting street corner rosaries, the protestors leaflet passing traffic, as well as harangue visitors leaving the gallery and sale. One woman asks the most persistent protestor What's wrong with that, wasn't Mary a woman? 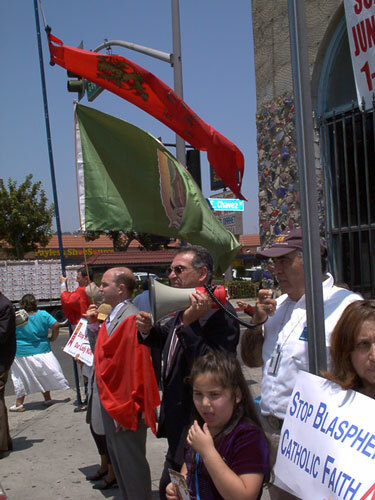 The protestor refuses an answer, shaking her short coiff and repeats her mantra, Don't blaspheme our Lady. Next year's sale is only a year distant. In the fall, for the holidays, comes a craft and art sale. Make plans. Support community arts.